Just as electric vehicle sales have climbed steadily over the last five years, so have the searches around electric cars. Connexity's Hitwise charted the search volume of variations on the term “electric car” over the last three years, and there is a consistent rise in consumer interest. 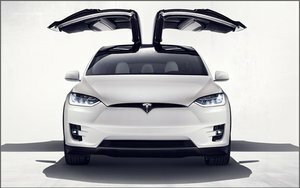 Tesla remains out of reach for most consumers, although they have shown dedication to more reasonably priced models. Using its proprietary AudienceView platform, Connexity's Hitwise examined in-depth profiles of consumers that have purchased new or leased electric vehicles to understand whether today’s consumer is truly paving the way for tomorrow’s auto industry. The platform identified that the strongest age segment for electric vehicle ownership is age 35-44, whereas older Millennials and older Gen X consumers lead with leasing. The analysis is based on U.S. adults who searched online for electric vehicle-related terms during the 4-week period ending Oct. 22. Most electric vehicle owners over-index for being married, but there were sharp differences when it came to having children in a household. The profiles showed that electric vehicle owners and lessees under-index in having children, but those who search online for electric vehicles over-index for having kids. Tesla owners over-index by 88% for being married and for having children age 10+ in the household. Tesla consumers are 54.5% male, have a median age of 39 and a high median household income of $422K. The affluence of this segment is unsurprising considering that Tesla has a $100K+ price tag for most models (except the Model 3 announced in March 2016, to be released next year). Taking a look at those who own or lease a more affordable Toyota Prius, Chevrolet Volt, Nissan Leaf or BMW i3, Hitwise sees some distinctions from the Tesla audience: they have a median household income between $118K and 184K, which remains well above average but not nearly as wealthy as Tesla owners. Across the board, any consumer with a household income under $75K is significantly less likely to own or lease an electric vehicle. Electric vehicle owners and lessees are also highly educated; Tesla owners in particular are much more likely to have at least a college degree. Electric vehicle consumers over-index for expressing concern “about pollution and congestion caused by cars” and admit they would “buy eco-friendly products if they were less expensive,” indicating that cost is definitely a factor for these consumers. When looking at searches for electric vehicles within the automotive category, Hitwise sees that the top two searches are Tesla and the affordable Tesla Model 3, with Prius falling just outside of the top ten. The high ranking of the Tesla Model 3 suggests strong consumer interest — and with a $35,000 price tag (about half the cost of the Model S) it also demonstrates that Tesla is committed to reaching the mainstream consumer.